It recently occurred to me that while there are some delightful magic shows in New York City, and no shortage of good variety shows, and even a couple of excellent magic variety shows, there was (to my knowledge, at least) no show in New York City in which the public could see mentalism in a variety show format. That is to say, there was no show that featured multiple mentalists performing solo acts of fifteen to twenty minutes within the context of a larger show. How could such an unsettling vacancy exist in our fair metropolis? And why wasn't anyone doing anything about it? Don't we have elected officials whose job it is to ensure that the public can see consistently superb mentalism on a regular basis? I researched the matter and discovered that, alas, no city, state, or federal agency is charged with producing mentalism variety shows, which leaves it up to private citizens to fill the conspicuous void in the realm of public entertainment. And so, I stepped up. 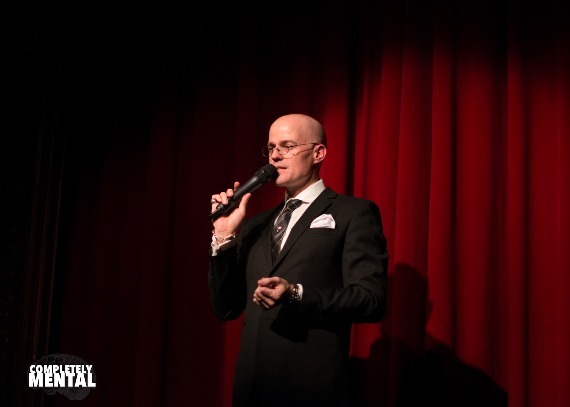 I decided that if a mentalism variety show was going to be produced in New York City, it was up to me to make it happen. 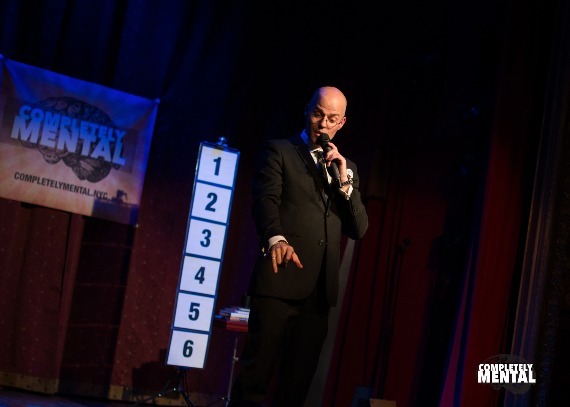 And thus, Completely Mental was born: an (almost) entirely mentalism variety show hosted by yours truly and featuring the finest mentalists and mind-readers in New York City. On November 30th of this year, Completely Mental debuted at The Slipper Room on the Lower Eastside, and what a glorious evening it was, my friends! Minds were read. Thoughts were divined. Fortunes were won and lost. The second glorious installment of this magnificent show will be on Wednesday, December 28th at 8:00, and will again take place at The Slipper Room. I currently have three more show dates scheduled for 2017, and you can read all about them here. For the latest information and updates on the show, please subscribe to the Completely Mental blog or follow me on Facebook. 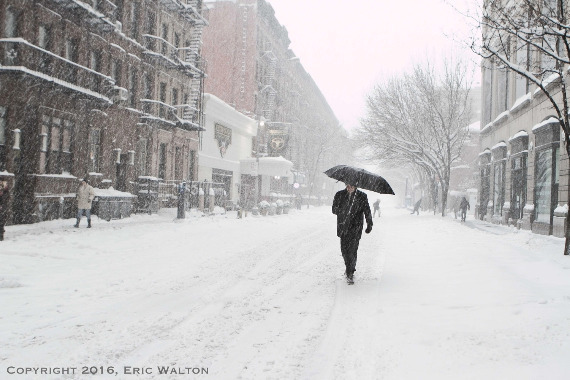 With a partial ban on vehicular traffic in place, pedestrians in Manhattan walked freely in the streets. 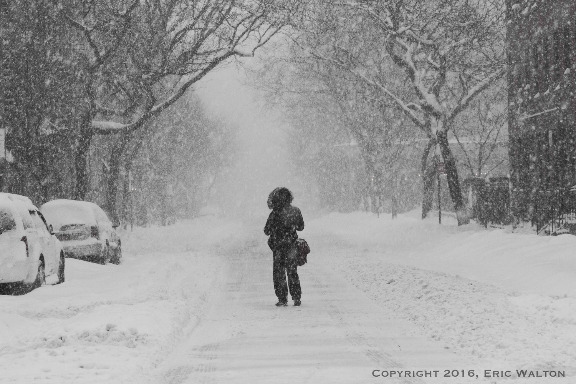 Walking was the preferred moyens de transport for most people who braved the storm on Saturday. 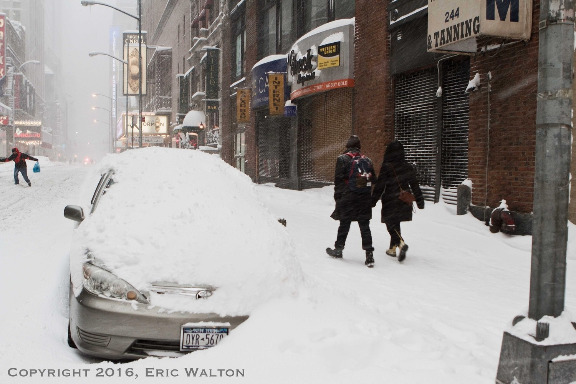 Some even used the sidewalks. 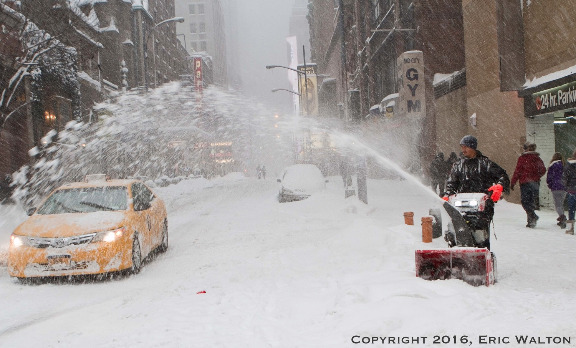 A woman ponders the meaning of it all in the middle of a street in Hell's Kitchen. 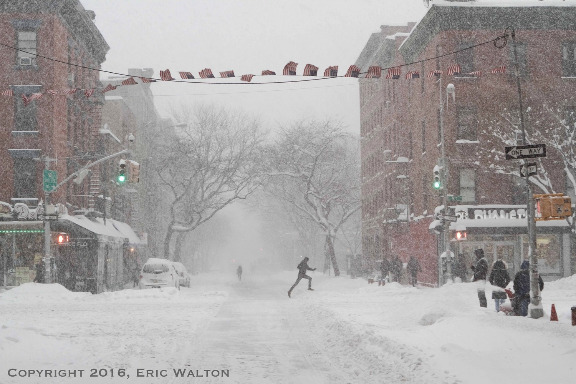 A man leaps over a snow-bank in Hell's Kitchen. 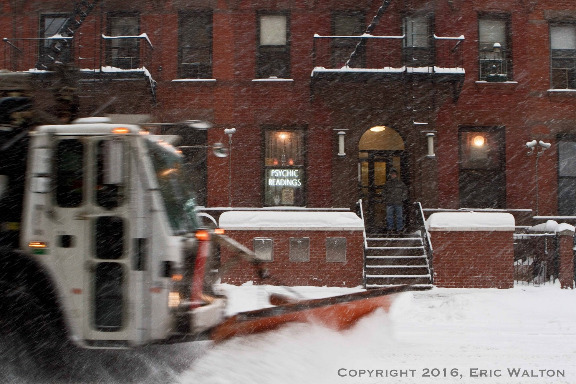 A snowplow clears a street in Hell's Kitchen. 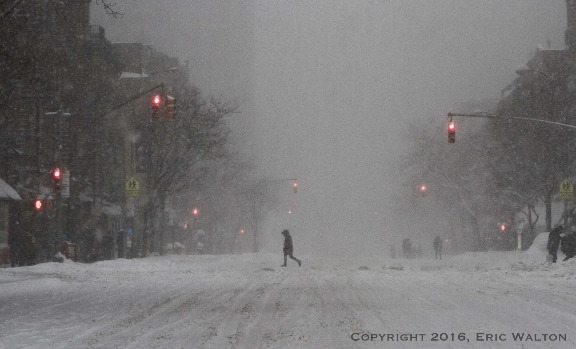 A pedestrian crosses Ninth Avenue. 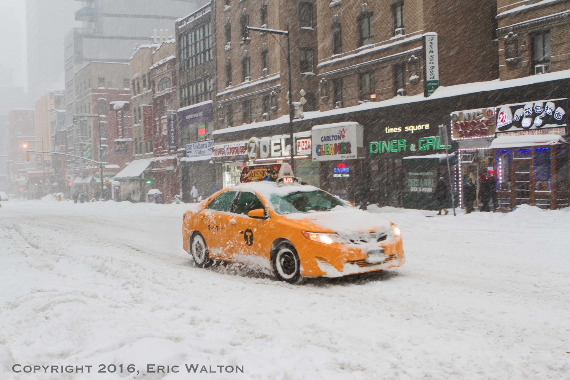 As this cabbie learned, the clean-up effort can be a messy one. Combining the whimsy of the limerick with the subtlety of the haiku, the prodigious Tom Swifty is a form of punsmanship that has enjoyed far too little attention and much too little acclaim in recent decades. Defined (somewhat clumsily, in my opinion) by Dictionary.com as “a play on words consisting of a made-up quotation followed by a punning adverb,” the Tom Swifty was once a popular fixture on the back page of Boy's Life magazine, but is virtually unknown today to all but a handful of logophiles and punsmiths. This is not as it should be. The Tom Swifty is not only a kind of litmus test for cleverness, but also a superb outlet for that woefully underrated virtue, and as such, deserves a much wider audience than it currently has. It is thus my intention, dear reader, to ignite your interest in and foment a recrudescence of the venerable tradition of the Tom Swifty by sharing with you a few dozen of my own original Tom Swifty compositions. “Only the Almighty knows the ratio of a circle's diameter to its circumference,” said Tom piously. “And this is your grandfather's final resting place,” said Tom gravely. “I do not believe in your Old Testament prophets,” said Tom mosaically. “I have been vouchsafed a vision of the future,” said Tom predictably. “Jesus died for your sins,” said Tom crossly. “When do you graduate from seminary?” asked Tom reverently. “I'd like to have a word with the priest,” said Tom vicariously. “Have you had the chance to explore the basement of the cathedral?” asked Tom cryptically. “How I do adore Voltaire,” said Tom candidly. “How are your spirits?” asked Tom blithely. “I suppose the acrobats were okay,” said Tom flippantly. “I prefer last night's emcee to tonight's,” said Tom comparatively. “Where did you study acting?” asked Tom methodically. “Which of you is the Marquis?” asked Tom sadistically. “I enjoyed meeting your friend Pacabel,” said Tom canonically. “Prospero is by far my favorite Shakespearean character,” said Tom tempestuously. “How many times must I tell you? You stress the second and fourth syllables!” said Tom emphatically. “I'm not especially fond of that particular hip-hop artist,” said Tom icily. “That piano is fabulous!” said Tom grandly. “You simply must see the new production of The Importance of Being Earnest!” said Tom wildly. “This macaroni and cheese is delicious,” said Tom craftily. “I'll have the pancakes,” said Tom flatly. “I can't seem to escape from beneath this citrus fruit!” said Tom sublimely. “Mr. Chang, this soup is delicious,” said Tom wantonly. “I'm afraid this apple is not yet ripe,” said Tom bitterly. “I'll have the tuna,” said Tom mercurially. “My bananas, apples, and plums have all gone missing!” said Tom fruitlessly. “Sir, would either you or your lovely wife care for some fresh Parmesan?” asked Tom ingratiatingly. “I have prepared the olives, cherries, peaches, and avocados,” said Tom pitilessly. “Give me three orders of deep-fried Twinkies,” said Tom unctuously. “I simply despise McDonald's,” said Tom archly. “Tonight's specials include raw, unseasoned potato wedges and dry white toast,” said Tom blandly. “Can you recommend a good restaurant in Budapest?” asked Tom hungrily. “We shall travel to the Westside of Manhattan, and there we shall board a decommissioned battleship!” said Tom intrepidly. “When will your hotel have an available room?” asked Tom vacantly. “Is London always this foggy?” asked Tom opaquely. “The street names in Paris are so confusing,” said Tom ruefully. Several years ago, a certain theater critic included in an otherwise very laudatory review of one of my shows the impertinent observation that a poem that I recited in the course of it could have been shorter. It was the only statement in his review which I found objectionable and in defense of my lengthy poem I composed (and here present) another lengthy poem.